A chiseled hillside in Mesa Verde. 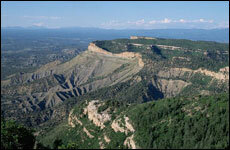 The long green table, Mesa Verde, stands a thousand feet above the Montezuma Valley in southwestern Colorado. Its colors, in fact, are not merely juniper green but olive, sage, burnt umber, sienna, russet, and similar high desert modulationsif one ignores bright little explosions of flowers. Overhead, suffusing everything, an immense Western sky. Except for ancient stone-and-mortar cliff houses stuck to precipitous canyon walls there is scarcely a building in sight. What prevails throughout the national park is a feeling that one must be near the rim of the world. In 1888 a rancher looking for stray cattle noticed an apartment house clinging to a canyon wall. He and his brother-in-law found a way up and explored the rooms, leaving fresh boot tracks in centuries of dust. Here and there lay sandals, arrows, baskets, stone axes, painted clay mugs, seed jars, ladles, bowls, metates, and other household goodsas if the people had only stepped out and might return at any moment. During the next several decades almost 600 cliff dwellings were discovered. The tallest building stood 86 feet high and had 80 rooms. Cliff Palace, the largest, held 151 rooms and 23 circular kivasthese being subsurface chambers used for religious discussion and sometimes by men who perhaps just wanted to get away from the wife. Not long ago an East Coast friend of mine decided to visit Santa Fe. The provincial Southwest rather bored him; nonetheless, I proposed a tour of Mesa Verde. As we drove up the narrow curling road through evergreens, past variegated bluffs, he did not say much. We drove to the highest point and looked around. There was a hawk sailing the current, mesas, canyons, purple shadows, nothing else for about a thousand miles. Near the park's museum we sat on a bench and looked down at a creamy ruin called Spruce Tree House. There were slowly moving shadows, sunlight on disintegrating walls, and the mysterious aura of people seven centuries gone. My Eastern friend did not move or speak for half an hour. Now he wants to come back.